Due to its speed and accuracy, laser marking is widely established in industries with high volume production lines, particularly: aerospace, automotive, medical, clock making and electronics. Its ability to mark materials, metal or plastic, regardless of hardness or surface texture makes it a primary solution for production part marking. The flip-side of marking, though, is reading the mark back. 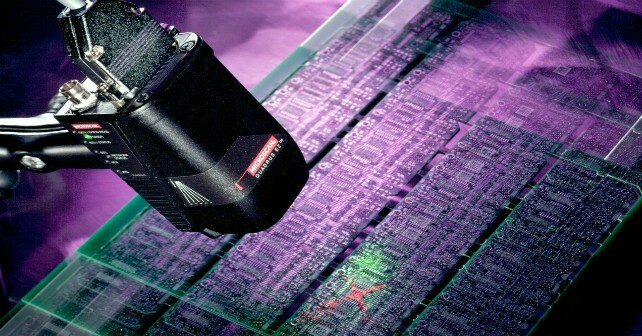 In this case, the very lack of restriction for laser marking can mean it is necessary to read from any shape, colour and/or material of a part. These circumstances call for a more sophisticated lighting solution than may be supplied with your camera, especially if it is a standard mono-directional, single colour (often red) integrated light. Green LEDs: Green lighting uses the brightest part of the spectrum of visible light (our eyes are more sensitive to this part of the spectrum than any other), and so provides the greatest range of available luminosity. Ring lights: A ring light surrounds the object under inspection providing efficient coverage to the code which is to be read, especially in conjunction with a diffusion dome. Diffusion dome: The diffusion dome reduces reflection, shade and shadow which may be caused by ambient lighting; this brings a superior degree of control to your machine vision solution when combined with adjustable lighting. Adjustable lighting: Now you have the elements of the perfect lighting solution, you don’t want it fixed all the time. Completing your machine vision lighting with an adjustable solution will allow it to be tuned to the specific application you need.